The reduction test came back and it turns out that Noah has an intolerance to carbs. This is why he has such bad diareah and gets so upset when he eats. He doesn't feel good! The GI team said that he most likely got a virus that killed the villi in his intestines. They will eventually regrow but it can take several months. Yes, my mouth hit the floor on this one. Several more months of fussiness, not eating, upset tummy, and the worst diaper rash I have ever seen. I don't think it can be classified as a rash. It looks much more like a burn or open sore. But the only treatment is to continue to feed him through it until he gets better. Other than that, he's doing great. Lilly and Noah both had Feeding Therapy today. It went well. I chatted with another Heart Transplant Mother from Kansas. All I can say about that is.... Transplant is hard. Shane comes in tonight and then we don't have another Clinic visit until Tuesday due to the Holiday. So hopefully the weekend is uneventful and fun... I'll post another update on Tuesday after his visit so you can stay updated on his progress. Happy Labor Day! I love and miss you all. Still no word on the poop samples. Most came back negative which is good. The one we are still waiting on is the reduction test. This tells us if he has a hard time tolerating carbs, or proteins, or something else. We sent the sample in but then it got lost in the computer (the order not the sample itself) so I had to deliver a new cup yesterday. We should find out more about it tomorrow at clinic. Clinic has been tough. It's so early when you have been up all night. I set my alarm and I still end up sleeping through it and waking right when I should be leaving. I've gotten there in time but without makeup or my hair combed. Owell.... Allison doesn't seem to mind. Everything else here in Denver is going alright. Tomorrow will be TWO weeks since Noah was released from the Hospital. I can't even begin to tell you how happy that makes me. It's SO wonderful having him here. The ONLY thing missing is Shane. But, he's coming out again tomorrow night. Which is good. I miss him SO much. This past two weeks has gone by SO slow. But he gets to stay an extra night and goes home Monday night instead of Sunday. Then my parents are coming for a visit on Thursday night. They only get to stay until Sunday morning but I couldn't be more excited to see them. I miss my family and I miss my friends. While to some degree I have become more comfortable here, it isn't the same. So, I am VERY happy they were able to work it out and come see us. Some more great news, our cousins the Scadlocks have posted an update on Baby Beckham and he is doing wonderful. I know they would love some encouraging words over at their blog. One last thing... I recently met a young girl name Crystal here (it gets crazier) who recently had a skin graft because she got Flesh eating bacteria from going to a water park with a sliver in her toe. She almost lost her leg but they were able to save it after cutting out the infection. I felt such a bond to her because she almost lost a limb, I almost lost my foot, we both had skin grafts, we are both blond and about the same age (she's probably about 16 or so) and to top it all off, we have the same name. and mental note to self.... check for open wounds before swimming in a public pool.... gross! Everything went well at Noah's clinic visit today. I won't know how his echo looked until they call me this afternoon with the update and med changes. So far all the stool samples have come back clean. The only ones we are still waiting on are the virus and the reducing one. The reduction test will show if he's having a hard time digesting certain things like protein or carbs or an amino acid.... that's the one I really hope is negative. I have no idea when those results will come back but today would be nice. He's also doing much better since his bum is now numb. I can tell he's still a little upset sometimes because his tummy hurts but overall he's being a very good boy. And still cute as ever!! Aerodynamically, the bumble bee shouldn't be able to fly, but the bumble bee doesn't know it so it goes on flying anyways. P.S. Speaking of Mary Kay Ash, she is an amazing person who I completely admire. If your looking for a very good, motivating book to read, I would suggest her Auto-Biography. If you want a copy, let me know. I can get them cheap ($5 I think). Its so good I read it in 2 days. Now Lilly is another story. She is going through some MAJOR separation anxiety. Every time I try to put her in her packnplay to sleep so starts screaming this terrified scream and holds on to me for dear life. Then if I try to have her sleep in my bed, she stays up all night trying to play, and giving me kisses, and patting my cheeks. She is such a sweetheart but we both need to sleep! I got a fold out bed and I'm going to try having her sleep on that so we can lay by her until she falls asleep. It goes against everything I worked for up toward now with her sleeping habits, but at this point I don't see much choice. I hope she overcomes this and can get back to her old self once we go home. Only time will tell. Today Noah had his first out-patient PT appointment. He's doing great! The Therapist said he's already made a lot of progress since he was released. He will be going every week and he also starts Feeding Therapy (Occupational or OT) on Friday. And Lilly gets to go to since she has never finished her OT since I ended up getting sick (I was pregnant) and then she got sick (the nasty Roto incident) and then we came here. The Childrens Hospital was so wonderful to work with her too. So, until tomorrow.... I'll let you all know how the visit turns out. 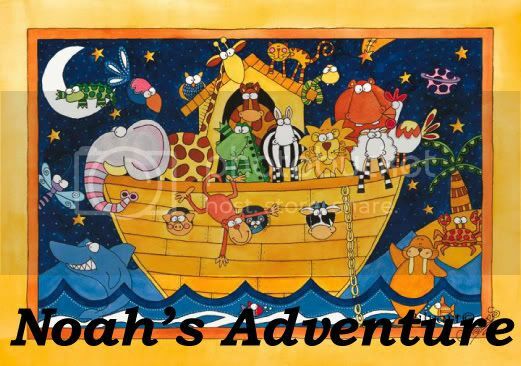 Yes... Noah was released last Thursday. I'm so sorry it has taken me so long to post. Shane came the night he was released and stayed for the weekend, then yesterday and today have been crazy to say the least. 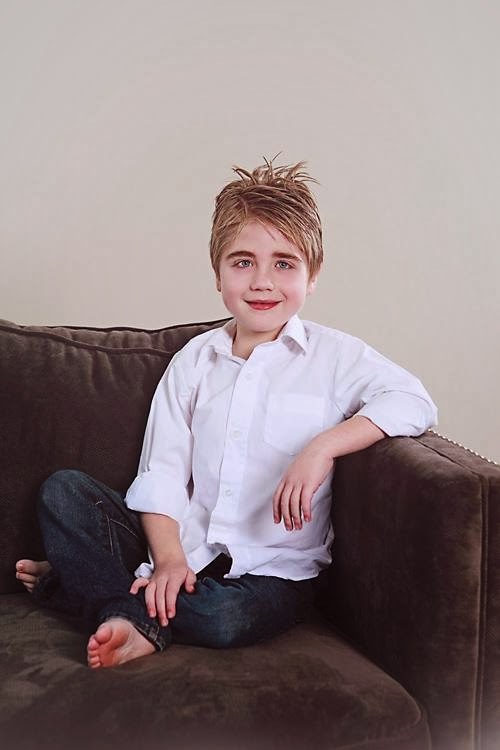 Noah was sent home on a list of meds LONGER than the first time. But it doesn't seem as overwhelming since I kinda know what I'm doing now. He's also on Oxygen and still has his feeding tube. He gets meds at 7am, 8am, 3pm, 4pm, 8pm, 11pm, and 12am. Several meds each time. YUCKY! But... they will be slowly weened. He has had 2 clinic visits so far that have gone MUCH better than before since he wasn't readmitted. I'm going to go call my sweet husband and wish him good night so I'm going to cut this post short, but to make up for it, here are a few pictures. I can't forget Princess Lilly. She is wearing her new princess shoes (and her jammies) that we won the night before at Bingo. I will update more details on Monday, but rest assured he is doing MUCH better than he was last time he was released. He has his clinic on Monday and we'll find out then exactly how well he's doing.... so I will let you know. My wonderful friend Jen had her baby!! Everything went well and both Mom and Baby are healthy. Brennon Park Tippets was born August 14th. I'll post pictures soon. Today the Dr's told me they are getting ready to discharge Noah. As long as I am comfortable with it. I told them I was as long as he was well enough that we WOULDN'T BE COMING BACK!!! He was a little pukey but that's probably because they are trying to quicken the pace of his feeds. He just needs to adjust. At least this time they will send me home with a pump so we can do them slow. He is still looking GREAT! He is such a ladies man. Everyone says they are his girlfriend and that he is their favorite patient. They even bring him into their nurses station and cuddle with him while they are charting. What a ladies man. So there is a small chance he will go home Wednesday afternoon, but more likely it will be Thursday (and home means the RMH). There is still a lot to get worked out with the home hospice care and what not. But if I don't feel he's ready or I'm not comfortable with it yet, we will wait for Monday. So, I guess we'll see how I feel after his labs and chest x-ray come back tomorrow. (Wednesday as I am writing this late Tuesday night/early Wednesday morning). I'll keep you updated. But you just have to know... He is doing SO well. He looks SO healthy and is such a good baby. It just amazes me to think how sick he was and how close we came to losing him. And now... I think we are finally moving forward to the rest of a beautiful and blessed life. Noah continues to do well today. One odd (and not so good) thing, he had ectopy again this morning. They did DC his potassium supplement last night so that might have been the reason because it cleared up by the afternoon. But still not something I wanted to ever see again. He had his Newborn Hearing Screening done today and passed with flying colors. He also had his first PT (Physical Therapy) session. He hasn't been able to move and act like a healthy baby does so we are going to work on getting his body back into shape (baby shape that is). They have also weened several meds and started him on a new one called Verapamil. It's a Calcium Channel Blocker. (I've taken one for Migraines for years) It should help reduce the pressure in his heart and help lower his heart rate a bit. This will help his heart fill more and be able to push out more blood. See, he has what's called a Co-Arc. Its where the new heart's Aorta was stitched to his own Aorta becomes a little narrower and tighter. Because of this, it's harder for the heart to push the blood out and the muscle in his left ventricle is becoming too thick. This new med should help fix this problem, but there is a chance they will need to take him back to the Cath Lab to balloon the Co Arc. But for now, that's NOT the plan. He's just fine. This should just help make him better. Lilly, on the other hand, was an absolute pill today. Jen said she was fine for her but as soon as I got here it was one tantrum after another. I know she misses her Daddy. One fun thing here at the RMH... tonight was Bingo night. A group or family comes and sponsors a few games of bingo and you can win toys for the kids. They have blankets, coloring books, stuffed animals, movies, books, toys, and tonight two big special toys for the final games of blackout. And I WON!! I won several small games and got Lilly some coloring books and a cookie monster friend, and a beanie baby. And the final blackout game I was able to get her a Workout Care Bear. It talks and moves and "exercises". She was very excited. But I think she had more fun trying to climb in the box then she did with the Bear at first. Today you are two months old. They have been rough months for you but you have been so strong. You are my hero. You are capable of anything and I know Heavenly Father has wonderful things in store for you. Keep fighting my little man. We have a life time of memories to make together. Noah is looking so much better. I am really happy with his progress. He continued to have a harder time breathing today but it wasn't any worse than yesterday. They decided to switch him to bolus feeds instead of continuous (giving it in bulk as if he had eaten it on his own) so that there would be more time without anything in his tummy to see if that will help ease the pressure on his lungs. I even tried to give him a bottle again today. He did a very small amount but I am happy with anything at this point. We start the feeding therapy again tomorrow. I went there this morning to see him and he was asleep the whole time. I didn't want to disturb him so I just sat and watched him sleep. Then this afternoon when I went back he was awake. So I played with him for almost 3 hours. I talked to him and sang to him and gave him tons of kisses. He smiled and sucked his paci. It was so nice. He hasn't started cooing yet but hopefully that comes soon. I did have to change his bum several times. Every time it was clean he'd wait 3 minutes and poop again.... definitely a Martin. First of all, Noah is doing well. They pulled his feeding tube back into his stomach and he has tolerated it fairly well. He was having a harder time breathing today (as the stomach swells there is less room for his sick lungs to expand) but the Chest X-Ray looked OK. So they are just going to keep a close eye on it. He currently has NO IV's and has the chubbiest cheeks I've seen since Lilly was little. SO stinking cute. He is a cuddle bug, which I love. When the nurses aren't busy, they hold him a lot. Last night his nurse cuddled (and unofficially napped) with him for almost 2 hours. I'm so glad they are taking good care of my baby. I wish I could be there more but I know Lilly needs me too. Second, I recently found out that the son of my Dad's cousin recently had a baby with similar heart defects as Noah. Little Beckham is currently on the National Transplant List in Iowa. Please keep him and his family in your prayers. Your prayers and love have been such a comfort to me and I know they have helped Noah continue to get better. Little Beckham could use some extra prayers right now too. You can check up on his progress at his family's website: Our Baby Beckham. Third, I have a new friend here in the internet world. She has become my very own personal Angel. Her name is Jenny and she is so loving and compasionate to the families of sick kids. She has been a huge supporter of Noah and has posted his story on her GusGang blog to ask for prayers on his behalf. I could not be more grateful. Her pesonal blog is also a wonderful read and keeps me entertained on a daily basis. You can check it out at JennyUpTheHill. Little Noah is doing much better. I have a good feeling that he's finally on the up and up. 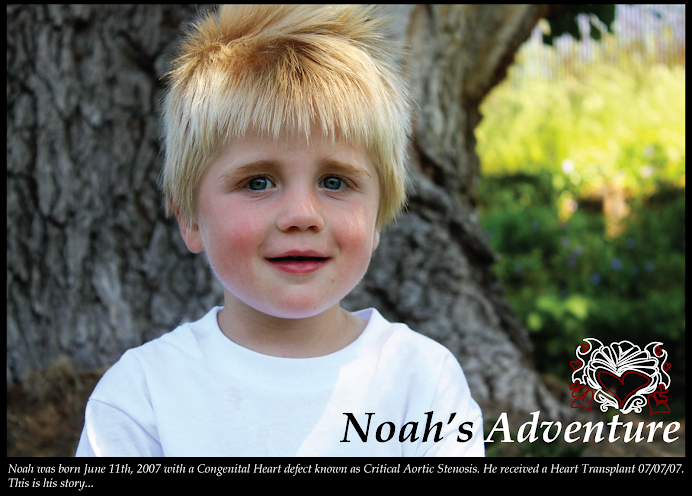 Today is One Month since Noah received his new heart. I wanted to take a moment and remember the family who so graciously turned their tragedy into my miracle by making such an important decision to donate during their pain. I'm know they are still suffering and my heart aches for them. I just hope they know the amazing gift they have given me and how grateful I am. Are We Leaving the ICU?? Noah was doing much better today. He looked good and his pressures were good. He wasn't having such a hard time breathing and he hasn't had any ectopy (weird heart rhythms) in a few days. His lungs are still damaged but they are getting better. Since they were so damaged with having a bad heart for so long which caused the Pulmonary Hypertension and Edema and then they were even more damaged after the transfusion reaction, the Dr said it will be a long time before they ever look normal, if they ever do. She doesn't know what if any long term damage will be there but she doesn't suspect it will be too bad. But it is reasonable to say he will always have weaker lungs than a normal person his age. They have weened him off one of the blood pressure medicines so they kept his ART line in to continue monitoring his blood pressure more accurately than a cuff but since it was been good today, they will remove it tomorrow. They also said it's very likely he will be moved upstairs to the regular inpatient rooms and out of the ICU tomorrow. It's good to know he's getting better enough to be out of the ICU, upsetting because I know he won't have such one on one care that he gets in the ICU, and scary because I don't know if I dare believe this will be the last time we are in the ICU. I just don't want the Dr's to rush his recovery. I know he will recover, but Noah has already proven to be stubborn and difficult just like me. He will get better on his own terms and his own time frame. If they rush him too fast, he might backslide again. So I just hope this time its for good. His NG tube is still past his stomach and going into his intestines, so one thing we will have to work on for sure is his feedings. I just hope we can get that under control before they say we need to switch to a G tube (where it goes right into his stomach isn't of up his nose and down his throat). Like the poor kid doesn't have enough scars already! They have such a hard time getting veins for PICCs and IV's that he is poked all over his body with bruises and marks and they still come up empty handed. Not to mention his transplant scars, the drainage tube scars and his pig tail scar (the chest tube for his collapsed lung). But one good thing about him having them now, he will learn about them just like any little kid learns where their belly button is. Onyx was a beautiful little girl. She had more black, thick hair than I have ever seen on such a little girl. She was born with Hypoplastic Left Heart Sydrome. Heavenly Father sent her to earth with only half a heart because he wanted to keep the other half with him. Onyx passed away Sunday morning. My heart breaks for her mom, Sharon, who I met here at the RMH and in the CICU. I pray the Lord will bless their family with peace and comfort and help them through their time of tragedy. Noah is doing better with some things, not with others. Its hard to update when Shane is here but since he leaves tonight I will update soon. Lilly decorates Daddy with stickers from her new sticker book. Noah had a bad transfusion reaction to the blood he received on Saturday. By early Sunday morning, he was back in the ICU, sedated, and on a ventilator. And, he's swollen head to toe, can't open his eyes because of the hives on his eye lids, and he's cherry red. He was started on Steroids to treat this reaction but since we had been questioning rejection, they gave him very high doses of steroids known as Rejection treatment... He didn't get better. He continued to have weird heart ectopy (missed beats, pauses, bigemini, PVCs, PACs, and bradicardia). We also couldn't get an accurate blood pressure. For some reason we couldn't get it to read. His heart rate was very low though. SO... Dr. Pietra finally decided we needed to do a cath. Noah should have been better and since he wasn't and not even headed in that direction, we needed to know more. He went into the Cath lab about 6:15 last night. Once they got access and were working the cath up to his heart, Allison called to give me an update. Turns out, Noah's blood pressure was DANGEROUSLY high! In the 180's. Since he's an infant, that's the equivalent of an adult being in the 300's. (I can picture the Dr's reactions when they saw that... "HOLY CRAP!!") They finished the cath procedure, which included testing function, checking pressures, and taking 5 biopsies of his heart and he went straight down for a CT scan. The only thing they could think of that would cause pressure that high in addition to why his red blood cell levels keep dropping was a brain bleed. And from the way they were talking, they totally expected to find something completely devastating if not fatal. We walked down to imaging and I felt like I had a beast locked in a cage inside my chest. It was screaming and clawing to get out but I was able to keep it locked up and stay composed. It didn't take long and Allison came out to tell me everything was fine. They didn't find anything even slightly abnormal. No bleed and no damage. I could not have been more relieved. They also scanned his lungs and they looked fine too (still wet and sick but nothing horrible) except the upper right corner of his right lung was bad. What they figured was very resistant pneumonia. So he starts several new antibiotics to treat the pneumonia. He was started on several drugs to try and bring down his blood pressure. He had a renal ultrasound to make sure it wasn't kidney related and everything looked great. The heart biopsies came back 100% negative. NO REJECTION! The steroids got rid of it all and his heart looks great! In fact, since it can pump so much pressure, it's a very good strong heart! Hopefully things will start to look up. Even if we never know whats going on and causing the problems, as long as they STOP and he gets better, I will be completely fine with that! But before his Cath Proceedure... Yep, that's right. He's going back to the Cath Lab to try and get some answers about this confusing situation. This is a very big deal since they HATE to do caths so soon after transplant. And last time he got so sick! I got another dreaded phone call from the ICU this morning. Noah's lung developed a hole and the air was leaking into his chest cavity. Since the air has no place to go it can be deadly as it crushes the lung and then the heart. The surgeon came in and put a chest tube under his arm inbetween his ribs to release the air. This helped his lung expand again. They believe it did this cause his lungs are sick and stiff. And when they are stiff they don't expand and contract as well and it just popped a hole. They said he shouldn't have any problems long term related to this hole but we don't know what sort of problem he will have because of his TRALI. There is a TRALI expert here in Denver who will be coming to see Noah today and should be able to give me some more insight.